This month I become a bonafied parent of a teenager; my son turns 13. Along with finally letting him get his own Facebook account, I suddenly feel this pressure financially looming before me. After all his clothes are becoming far more expensive as we’re jumping into adult sizes, his car and car expenses are coming, and don’t get me started about the panic I feel about paying for college. 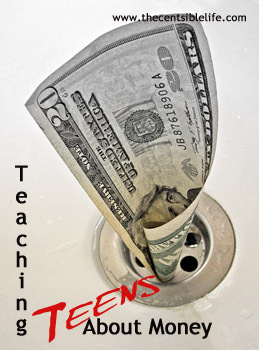 But the one thing I worry the most about is whether I have taught my teen about money effectively. understands emergency savings as we demanded he save a portion of his allowance and helped him set up an emergency savings account at the bank. What worries me is that this past year, his 12th year, we decided to loosen the reigns with his allowance. We stopped reminding him about where his allowance was supposed to go. He stopped saving for emergencies and stopped giving to charity. And although I’d like to blame this change in his behavior upon his newly discovered surly it’s-all-about-me side of his personality, honestly I think this lapse of his is really my husband and I’s fault. We broke one of my hard and fast rules. Avoid the sink or swim style of parenting. We gave him too much independence all at once and continued to throw his allowance at him expecting him to swim. 1. The boy will start receiving a monthly allowance instead of a weekly one. I’m hoping by doing this it will encourage him to develop better budgeting skills. 2. The first month we will help him develop a budget. The budget will include emergency savings and charitable savings accounts. We will also have him save his spending receipts, and input them in when he has time into some sort of tracking system. I want for him to see where his money is going, so that when he has a month in which he runs out of money too quickly, he can see where he is making his mistakes and can adjust for the next month, an important skill adults need to manage their money effectively. 3. He will be required to save 10% for charitable savings. I know not everyone thinks that donating to charity is a must, but I do and I want to pass this value on to my children. 5. He will turn his charitable and emergency savings in to his parents before he gets his next month’s allowance. If he doesn’t turn in at least 10% for charity, he will then have it deducted from the next month’s allowance. 6. Any odd jobs performed around the house or outside of the house such as babysitting falls under the savings rules. 7. He will still be responsible for paying for his cell phone bill and any other items that I deem unnecessary such as toys, video games, etc. I think this plan is solid enough to last until he gets his first job. Then naturally he will be introduced the concept of taxes. Of course we will look at the plan and periodically make changes where necessary. So what do you think? What are some other good tips or plans for teaching teens about money? Kelly Kinkaid, professional blogger and freelance writer, enjoys writing about such topics as stretching a dollar, personal finance, diet and fitness, and living a life well lived. She spends all of her spare time in her many roles including but not limited to soccer, basketball, swimmer, band, and piano mom, runner and wife. You may also contact her on Twitter as @Kellyology, or on Facebook. Hmm..I wonder if my 14 year old son will react good when I will teach him to be more responsible with money.I kind of spoiled him.After I read your article I understood that I have to teach him these lessons too. Love this.. Kids need and like rules. As a daughter of a financial planner we had lots of early training too. Where did Penny Power from consumer reports go? I want it for my daughter!! By highschool my dad taught us the value of investing with a bit of a family 401K toward college.. he gave us a healthy monthly incentive match on the first $25 or our own dollars deposited into our college fund. And while we may not have been able to buy everything we wanted, each of us always deposited that $25 at the first of the month. brilliant. I am so bad about doing this with my teen. So bad! It’s a personal decision, but I would recommend she uses her money similarly to the outline above. A portion for savings-though her % may be higher, a portion for giving if you’re inclined, and the rest for spending. If she has a goal to work to help pay for college or something similar you may decide to continue to give her spending money if she saves a certain percentage of her income. My 14 year old daughter has just got her first job , do you think we should still give her pocket money ?